On 1 September 1939 Hitler invaded the western half of Poland (and Stalin the eastern half 17 days later), so beginning World War 2. Much has written about what happened during the war, but not so much has been done to understand what led Hitler and Nazis to develop their notions with such intensity. 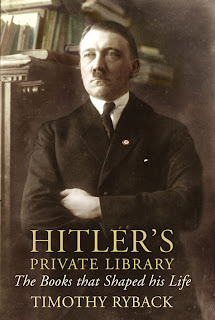 Although known as the person who burned books, Hitler was an avid reader and his personal library in 1945 amounted to 15,000 volumes. Many were books that were gifts he never saw, but about 3,000 were clearly books he poured over, an average of one a night, according to this author. 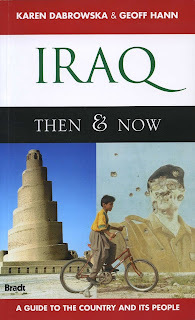 Apart from anti-semetic canards, military almanacs, and the like, there was a surprising range of eclectic books in the library that was discovered, much of which is now in Washington DC. These included Shakespeare (who Hitler considered "superior in every respect" to Goethe and Schiller), Karl May novels and the prophecies of Nostradamus (the Nazis used the ones they recognised themselves in as propoganda, as did the Allies in turn). But the racial notions and the theories of pseudo-scientists that were believed are the most significant. 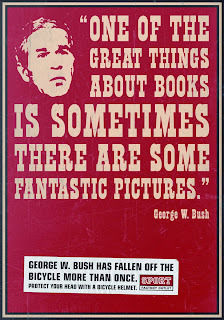 It is a reminder of a time when books were both read and were influential. 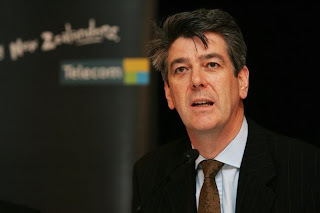 Although multi-million dollar payouts to NZ big business bosses are not unusual, eyebrows are being raised about the $7 million paid last year to Telecom boss, Scotsman Paul Reynolds. This is more than twice what his predecessor got and is despite a 44% fall in Telecom's profit. Barack Obama's disgust at people being "rewarded for failure" is very apt. Of course Reynolds is not the only Telecom bigshot who gets in excess of $1 million a year (the next 7 pay themselves $20 million a year between them); at the same time Telecom wants to reduce the pay and conditions of its linesmen who make about $40,000 a year. 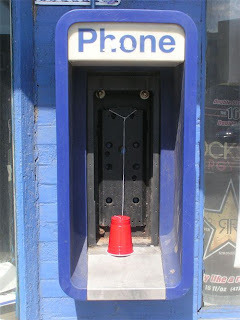 Telecom has long been known for its greedy exploitation of its monopoly position to milk revenue sources to the max (for example, in the 1990s charges for line rentals in NZ were about 6 times those in the USA), its technical retardation, particularly in broadband which has cost NZ dearly, and its autocratic authoritarian attitudes. Naturally big business will answer that they need to throw millions of dollars at people to attract talent. Yeah right. There are umpteen people in the country who could do a far better job than people like Reynolds who would be happy with 10% of his pay. It's time for big organisations to change their way of thinking. Do you crave excitement in life? Snowboarding down a mountain or paragliding off one doesn't quite do it? Then these three countries in the Muslim world may be just the thing. All three countries actually have a lot of cultural interest, and in the case of Iran and Afghanistan, some spectacular scenic areas. Until things settle down and order established (whenever that may be) you may want to just remain an armchair traveller for now, for which these three books, available at the transpress shop, are ideal. 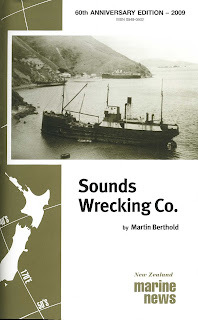 This 64 page booklet in A5 format on the former Sounds Wrecking Company in the Marlborough Sounds is a special 60th anniversary issue of the NZ Ship & Marine Society's Marine News. The society was founded in 1949 and caters for people interested in the country's maritime heritage as well as current news. 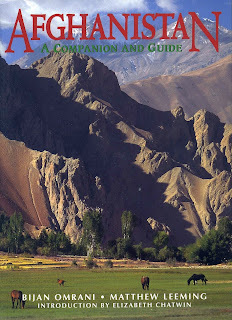 This well-illustrated publication is available from the Society directly for $10 including GST and postage within NZ. P.O. Box 5104, Wellington. The Society's website. Is the era of the well researched book ending? You can't help wonder when looking at what gets churned out by some NZ book publishers these days whether all people really want are books of pretty pictures. They are in some ways for the lowest common demoninator, people whose reading level is poor and who respond to images rather than written words. But it's not so simple. It is known that women prefer words and men pictures, which is why most fiction is bought by women. 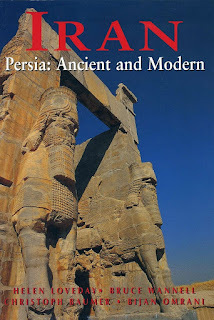 It is also the case that thoroughly researched books on historical, technological and scientific subjects are the exception rather than the norm nowadays in in NZ and this has been the case for quite a few years. People who write books usually do so here for love and not money because in most cases the money is poor: the hourly return for time spent is well below the minimum wage (not that the return for publishers is much better), but there needs to be some money in it. Those who write books about scandals and/or major celebrities can be assured of getting a good recompense from it, but not those who write the type of books which transpress focuses on. This is why the Government should financially assist skilled authors who do, but such help is rarely forthcoming unless, a) they know the right people, b) they are too elevated in the academic world to ignore, or c) they write on topics in accordance with the government politically correct stance of the time. 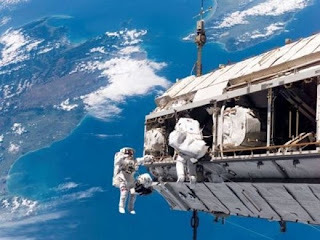 "That's New Zealand down there." "Yes, it's beautiful isn't it?" "Did you know that ferries used to sail along that coast between Wellington and Lyttelton and between Wellington and Nelson?" "Yes, there's a transpress book about them called Strait Crossing coming soon." "It'll be a great book, I'm looking forward to it." In May 1959 the Auckland Harbour Bridge - popularly known like its counterpart in Sydney from 1932 as 'the coathanger' - was completed and opened. 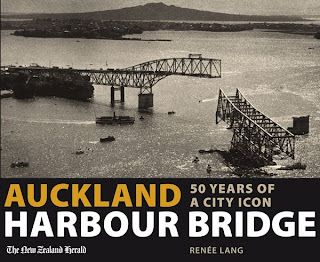 The 50th anniversary was not marked officially, but Random House and the NZ Herald have produced this pictorial history of what is the country's most iconic bridge. The story of its design, planning, financing and opening is not nearly as eventful as the one in Sydney, but something that dominates the cityscape can't be ignored, and until the building of the Skytower in the 1990s it was Auckland's identity symbol. There were obvious deficiencies with the bridge, reflecting politicians' usual lack of foresight, one of the most obvious can be seen by comparing the view of the Sydney bridge (from the G.B. Churchman collection, click for large view), taken the day after opening - why did the Auckland bridge have no provision for railway lines? 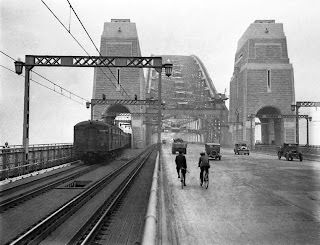 In fairness the tramlines on the east side of the Sydney bridge gave way to road traffic lanes in the late 1950s, but the railway lines serve a major role. The book on the Auckland bridge is available from the transpress shop.